"The eighth day following His birth, the Divine Child was presented in the Temple and circumcised according to the Law existing in Israel since the time of Abraham. On this occasion, He was given the name Jesus [“Jesus” means “he who saves” (http://www.greekorthodox.org.au/general/spirituality/thejesusprayer)], which the Archangel Gabriel announced to the All-Holy Virgin Mary. The Old Testament circumcision was the proto-type of the New Testament baptism. The circumcision of our Lord shows that He received upon Himself the true body of man and not just seemingly, as was later taught of Him by heretics. Our Lord was also circumcised because He wanted to fulfill the entire Law which He Himself gave through the prophets and forefathers. In fulfilling the written Law, He replaced it with Baptism in His Holy Church as was proclaimed by the Apostle Paul: "For neither does circumcision mean anything, nor does uncircumcision, but only a new creation" (Galatians 6:15). (In the cycle of the liturgical calendar of the Church, this Feast of the Lord's Circumcision has neither a Forefeast nor an Antefeast)." Our human form hast Thou taken on Thyself without change, O greatly-compassionate Master, though being God by nature; fulfilling the Law, Thou willingly receivest circumcision in the flesh, that Thou mightest end the shadow and roll away the veil of our sinful passions. Glory be to Thy goodness unto us. Glory be to Thy compassion. Glory, O Word, to Thine inexpressible condescension. Now the Lord of all that is doth undergo circumcision, in His goodness cutting off the sins and failings of mortals. 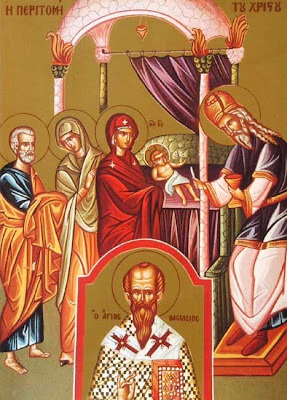 He this day doth give salvation unto the whole world; and the hierarch and bright daystar of the Creator now rejoiceth in the highest, Basil the wise and divine initiate of Christ.